Sorry folks to be a day late wishing my blogging community a very happy Thanksgiving Day but I was deep into cooking in the kitchen and when everyone went home I just collapsed. 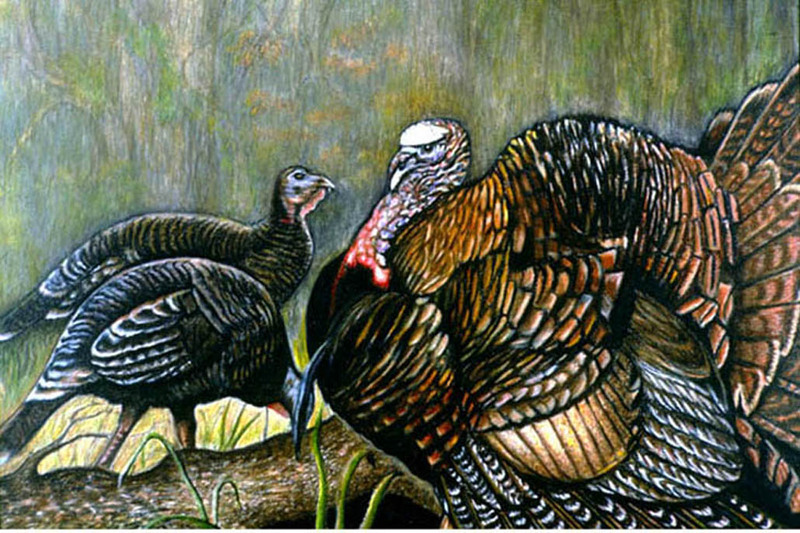 The drawing above was an entry into the annual Wild Turkey Stamp contest held each year by the State of Florida, US. This drawing is of the elusive Wild Osceola Turkey that roams the native forest and is darn hard to hunt. He/She is able to out smart the hunters but not the destruction of their habitat, hence endangered and only hunted on certain days with a stamp. This image did not win the contest but I thought you might like to see what beautiful birds they are. I do wish you all a wonderful day after holiday and if you are like me the day after is the best of the two! This entry was posted in Original artwork by June Pauline Zent, True Stories About Artwork, Uncategorized, Wild and tame animal stories and tagged art, artist, artwork, colored pencil, stories, wild animals, wild turkey. Bookmark the permalink. 22 Responses to HAPPY DAY AFTER TURKEY DAY! Happy thanksgiving June! Hope ur fine and well! I am getting there Soumya and had a woundeful Thanksgiving. Hope that you did too. It looks like I will have to have eye sergery soon and that is stressing me out. For a artist this is hard to deal with. I will be fine later though and I am very grateful for your support! Oh! thts sad to hear! still I believe you will be fine and wnt have have any problem ,,so dnt stress out for that. . My best wishes are with you. Thank you Subhan: you sweet man! You are right here no matter what and you are one of the marvels of the blogging world so I am honored! Hugs. Rahul, Just call me June. I know that I am much, much older than you and you are respecting me by calling me Madam but I feel a connection with you and a friendship. My friends call me June. You are such a bright , handsome guy with a ton of talent! I am proud to know you! I don’t know if you celebrate Thanksgiving but all it takes is lots of yummy food and being thankful as I am for you! Happy thanksgiving June! Hope you are fine and well! OMG Sharon ! I would love to be at your house the day after Thakdgiving; Sounds better than the real day and I bet you are a great cook! I know that your Thanksgiving was great! I had all of my family here and a 21 pound turkey that Berrie had to pull out of the oven. We had leftovers for several days. The best is the dressing fashoned after Grandma’s. It’s great on a sandwich! I will bet that you make it too. We will just have to keep going! I am going to have eye surgery soon so that wont help but I will be better than ever after! Thanks for checking in and lets keep trucking! Thank you nightlake. So glad to be back and very busy catching up but that’s a good thing. looking for ward to your awesome posts! Glad those turkeys survived Thanksgiving! Your artwork is fun! Oh yes, very beautiful right! I am glad that you enjoy the artwork. If you read the story of I promiced you remember there are twelve parts so start at the beginning then continued and on. You might like it. I sure do like your blog and thanks for the comment! A turkey who is alive on the day after Thanksgiving is a happy turkey indeed – so long as they can make it through Christmas as well!